A few years ago, my kids and I did a fun little activity where we dyed flowers different colors. At that time we marveled at our ability to make a white flower turn colors. During our more recent leaf unit study, I decided to have us revisit the flower dyeing activity, but this time using leaves instead of flowers. 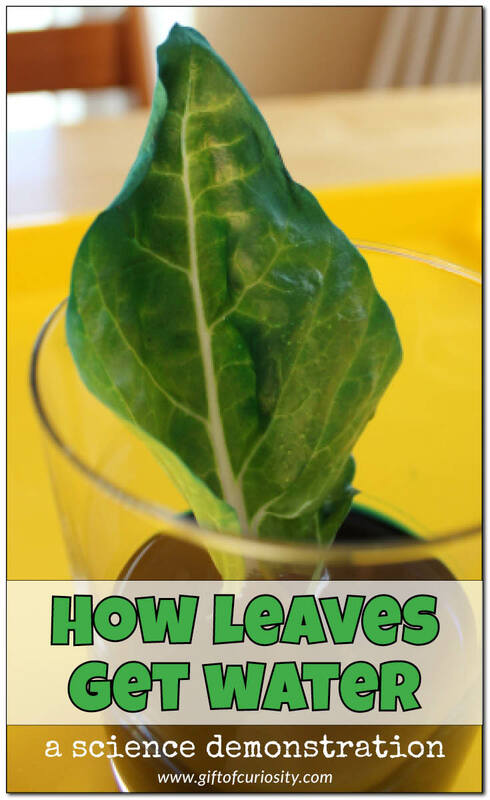 Although my kids already know that plants need water, this simple science activity demonstrates very clearly how leaves take up water their through veins and then spread it throughout the entire leaf. Plus, it’s always fun to watch things turn colors. 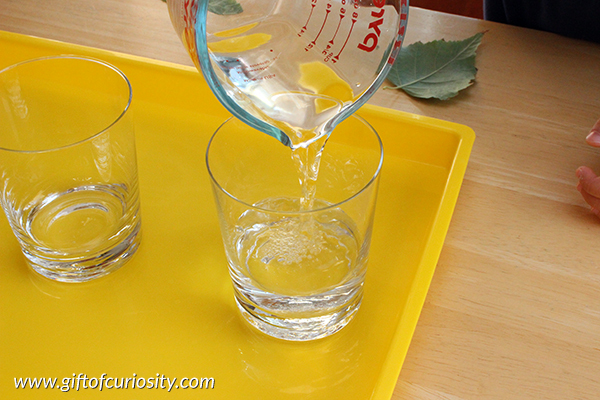 To do this activity, start by adding water to a glass. We own Colorations Liquid Watercolor Paints from Discount School Supply , and we use them all time in so many different ways. But you can also purchase quality liquid watercolors from Amazon. 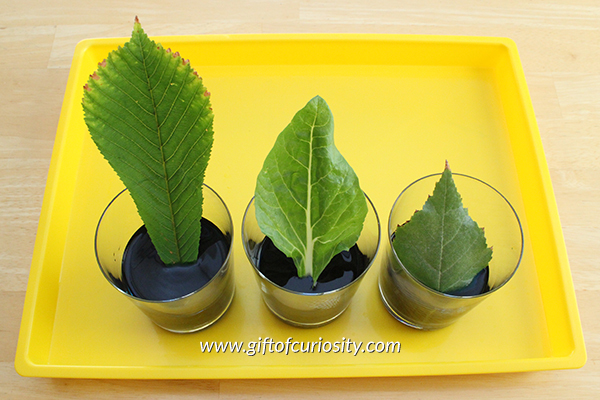 We actually tried this activity with three different leaves, and I’m glad we did. Two of the leaves ended up not changing colors hardly at all. One reason for this might have been the fact that we did this activity toward the end of fall, when leaves have already begun to close their veins for taking up new water. Or it might also be the case that some leaves just work better than others. 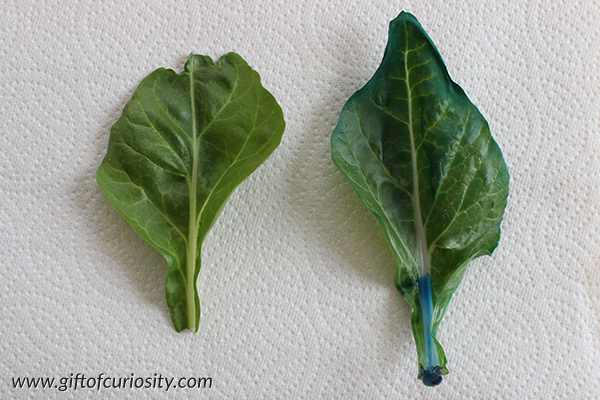 The middle leaf, which was a kale leaf from our backyard garden, was the one that changed color the most. 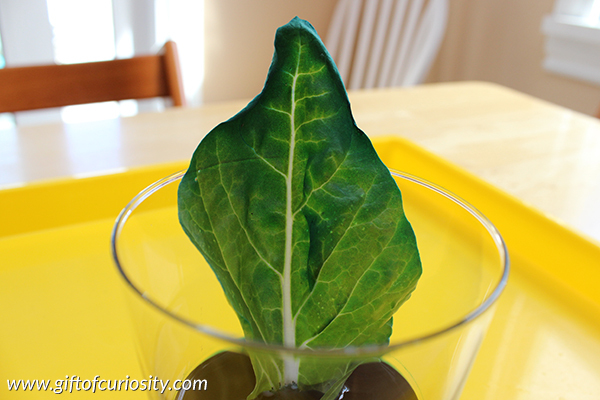 Over the course of two days, we watched as the leaf took on a distinct blueish tint. 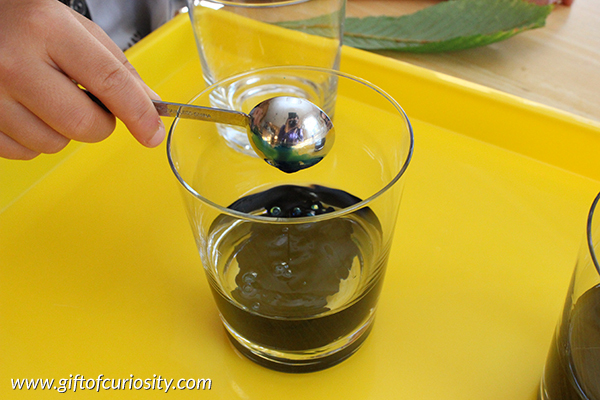 The blueish tint was even more obvious when we compared the leaf we had placed in blue water side-by-side with a leaf that had been placed in regular water. We observed the difference in color between the leaves, and talked about how and why the blue leaf had turned colors. Knowing that the blue leaf had been sitting in blue water and then turned blue made this a very concrete lesson in how leaves get water.